BY inscribing this Volume to you I am merely discharging a debt of gratitude and justice. But for you I believe it would not have been printed; for you not only advocated its publication, but have generously contributed to diminish the cost of its production to the "WILTSHIRE TOPOGRAPHICAL SOCIETY", under whose auspices it is now submitted to the public. 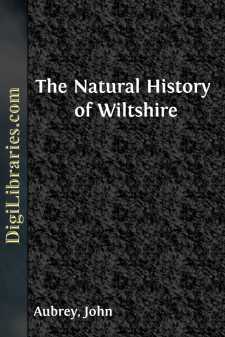 Though comparatively obsolete as regards its scientific, archaeological, and philosophical information, AUBREY'S "NATURAL HISTORY OF WILTSHIRE" is replete with curious and entertaining facts and suggestions, at once characterising the writer, and the age in which he lived, and illustrating the history and topography of his native county. Had this work been revised and printed by its author, as he wished and intended it to have been, it would have proved as useful and important as Plot's "Staffordshire" and "Oxfordshire"; Burton's "Leicestershire"; Morton's "Northamptonshire"; Philipott's "Kent"; or any others of its literary predecessors or contemporaries. It could not have failed to produce useful results to the county it describes; as it was calculated to promote inquiry, awaken curiosity, and plant seeds which might have produced a rich and valuable harvest of Topography. Aubrey justly complained of the apathy which prevailed in his time amongst Wiltshire men towards such topics ; and, notwithstanding the many improvements that have since been made in general science, literature, and art, I fear that the gentry and clergy of the county do not sufficiently appreciate the value and utility of local history; otherwise the Wiltshire Topographical Society would not linger for want of adequate and liberal support. Aubrey, Bishop Tanner, Henry Penruddocke Wyndham, Sir Richard Colt Hoare, and the writer of this address, have successively appealed to the inhabitants of the county to produce a history commensurate to its wealth and extent, and also to the many and varied objects of importance and interest which belong to it: but, alas ! all have failed, and I despair of living to see my native county amply and satisfactorily elucidated by either one or more topographers. By the formation of the Society already mentioned, by writing and superintending this volume and other preceding publications, and by various literary exertions during the last half century, I have endeavoured to promote the cause of Topography in Wiltshire ; and in doing so have often been encouraged by your sympathy and support. For this I am bound to offer you the expression of my very sincere thanks; and with an earnest wish that you may speedily complete your projected "History of Castle Combe,"
Burton Street, London. 1st September, 1847.